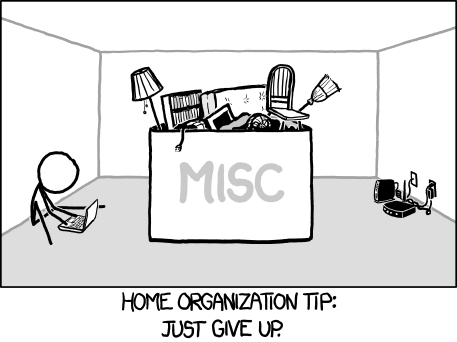 Source: the endlessly relevant xkcd. This work is licensed under a Creative Commons Attribution-NonCommercial 2.5 License. You should only use your work space for work and nothing else. Using it for other things dilutes the psychological link between your desk and the process of working, which makes it harder to stay focused. Ideally you should have a whole room as a dedicated home office, but this isn’t always possible. Using a corner of another room can work, although make sure it’s not a bedroom! Working in your bedroom can often lead to sleep problems, which will also negatively affect your work. If you use your work PC for other things, it might be worth investing in another display device and a wireless keyboard and mouse. This could be your TV, or if you don’t have one (because really, who needs it with Netflix and online catchup services?) a projector is great for video content and games. Laptops, of course, are extremely portable! Uptime is vital – being cut off at the wrong moment is hugely harmful to your flow, and if your connection is prone to cutting out you’ll never know if you’re getting all the emails you need. It’s a lot cheaper than commuting, so just go ahead and get a good quality connection. There’s nothing more depressing than staring at a screen and a wall all day, and happier people are generally more effective. On top of that, only focusing your eyes on near objects for long amounts of time can give you some serious eye strain, so it’s probably best if you put your desk by a window. Hopefully this has given you a few things to think about. What are your most important factors when setting up a home office? I think you’re right about separation between working and not working. Whether that’s a completely separate office, a desk only used for work, or something else. I personally find that having a separate work computer and personal computer works best for me. That means the work computer is never used for personal use, and the personal computer is never used for work use. Making sure the personal computer is not around while working helps to focus, and at the end of the day I switch off from work the moment the work computer does!